Description:Also known as Thinhorn sheep, Dall sheep are a species of mountain sheep with a naturally white coat. In the Yukon there is a regionally-limited colour phase known as Fannin’s sheep that have a brown patch over their torso and abdomen that resembles a brown blanket. There is also a small northern population of a Dall sheep subspecies known as Stone’s sheep that are primarily grey-brown with a lighter rump. Weighing up to 113 kg (250 lbs), Dall sheep are smaller than their Bighorn cousins, but still larger than most breeds of domestic sheep. While both males (rams) and females (ewes) have horns, the male horns grow much larger with a distinct mountain sheep curl beside their eyes. 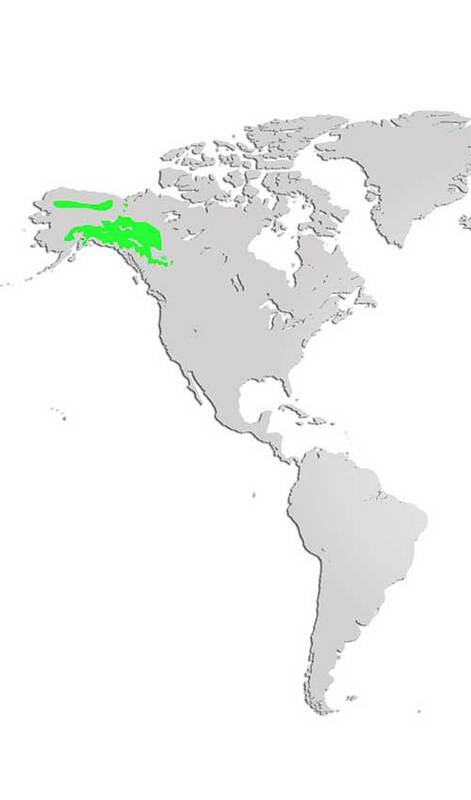 Distribution and Habitat: Dall sheep are found in the subarctic, mountainous areas of Alaska, the Yukon, western Northwest Territories and northern British Columbia. Each autumn, Dall sheep migrate a short distance to lower altitude territories that have south facing slopes and winds too high for snow accumulation. Flocks of sheep use the same migration paths and summer/winter territories through the generations. Prized for their meat and fleece, Dall sheep were overhunted to the point of near extinction during the 18th-19th centuries. Through conservation and reintroduction programs, populations of Dall sheep are currently increasing and no longer considered at risk. Diet: Like all sheep, Dall sheep are ruminants and therefore herbivores. During the summer months, Dall sheep eat a variety of different grasses but in winter their diet is much more restricted, consisting of frozen grass, sedges and lichens. Mineral licks are frequented by Dall sheep and they will travel several kilometres to spend time eating the salty earth. Life Cycle: Dall sheep rams compete violently for females during their mating season in November/December. Using a specialized gland exposed when they raise their upper lip, rams can detect a willing female via airborne pheromones (tiny scented molecules). Once a female is located, rams will start removing other males in the area through violent interactions involving, jumping, kicking and smashing their heads/ horns together. Lambs are born the following May, quickly getting to their feet and ready to follow their mothers within 24 hours of birth. Dall sheep have many predators including wolves, bears, coyotes, wolverines and lynx. Golden eagles will prey on young lambs small enough to be snatched into the air and carried away. Adaptations: Dall sheep rams have specially adapted air sinuses in their skulls to absorb the impact of slamming their heads against the heads, horns and bodies of other rams. These “air pillows” allow them to survive impact forces that would seriously injure or kill other animals. Did you know? As the horns of mountain sheep grow, annual bumpy rings form around their circumference. A Dall sheep’s age can be determined by counting the rings.